The Springer® Sidewalk Sign is the ultimate outdoor sign offering a winning combination of style, economy, versatility and visual impact. 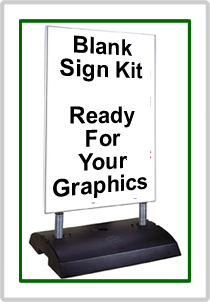 The 24" x 36" sign face is easily decorated with computer cut vinyl, screen printing or large format digital graphics.Springer® Sidewalk Signs have a compact, low-profile technopolymer base that can be water filled for added stability. Built-in hand holds make lifting a snap and the 18" wide base fits easily through any door. 24" x 45" Sidewalk Sign with 2-sided, blank white 24" x 36" sign face. 1 - 24" x 36" x 0.5" (600 x 900 x 10mm) blank white sign face.